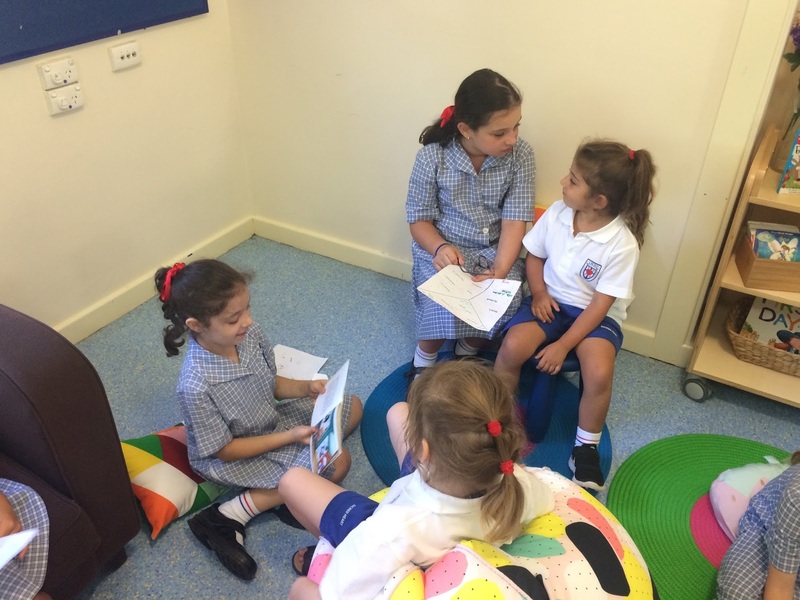 The staff at Sacred Heart have been working hard to teach and reinforce social skills with their students in Term 1. 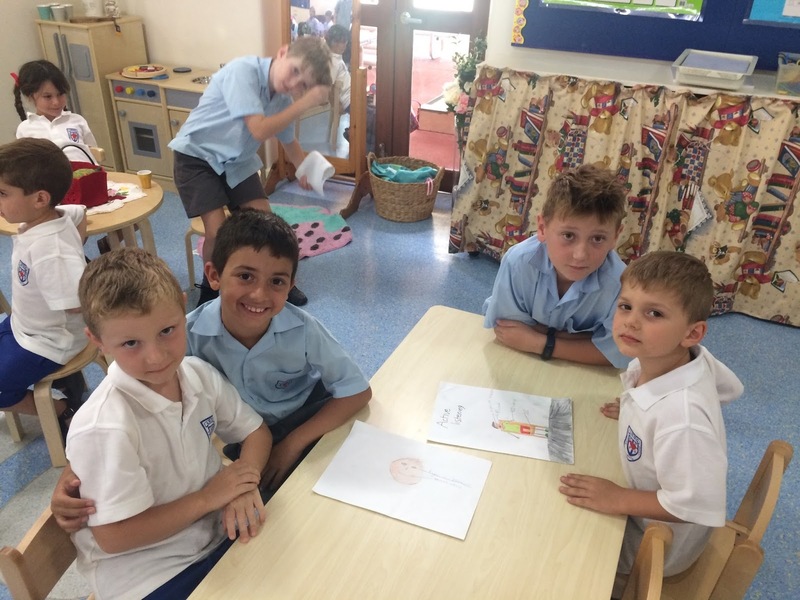 A short survey, created by the Social Skills Committee members, was completed by all staff at the end of Term 1 to determine three new social skills that will be a whole school focus in Term 2. Below are the 3 social skills, which have been identified as important to focus on in Term 2. The Social Skills Committee is meeting early in Term 2 to identify ways that staff can be further supported in teaching these skills. Watch this space for more exciting developments in Term 2! Over the last three weeks, our school social skill was ‘Moving around our school quietly.’ Sometimes, problems occur when students line up to leave the classroom to move to other areas of the school. In their eagerness to be first in line or to get to the next activity, they might run to the door, push their way to the front, or cut in line, often knocking into other students in the process. They might argue over who is the line leader, who stands next to whom, and who gets to hold the door. Problems can continue as they are walking around school, and at times, student’s incessant chatter might disrupt nearby classes. 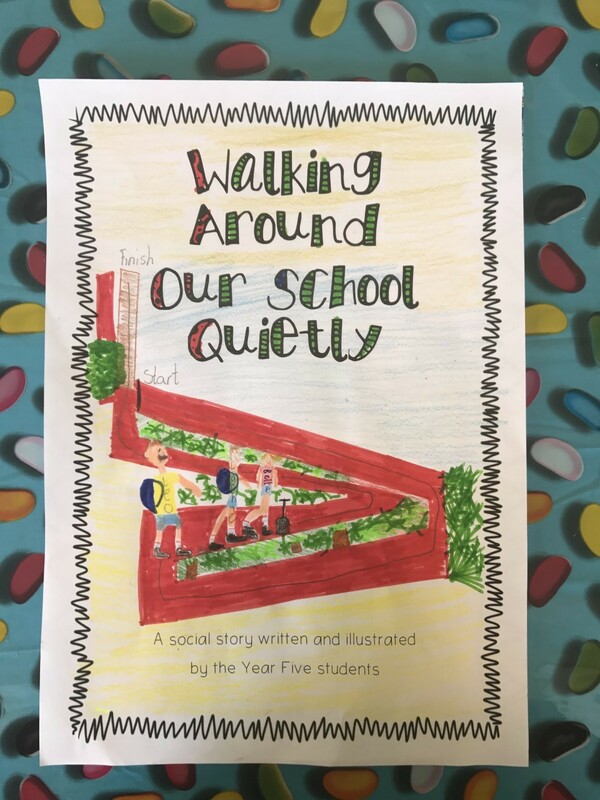 The Year Five students have created a social story and produced it into a book for each class to keep in their classroom and read, to remind them of the way we should be moving around our school. Why social stories? Social stories provide students with an easy to understand instruction on positive, appropriate social skills and behaviours in a fun and creative way. We also traced around our hands and created little posters to display around our school, to remind us about this social skill. One of our favourite activities was to create a poster showing all the important points of Active Listening. 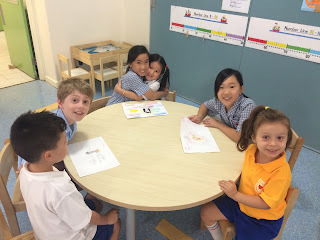 We then got to spend some time with our Pre-Primary buddies and teach them how to be good listeners. Our buddies were able to keep our posters to remind them about how to be a wonderful active listener. Welcome to Sacred Heart's Engaging Hearts and Minds Blog for 2017! Welcome to Sacred Heart's Engaging Hearts and Minds Blog for 2017! The staff at Sacred Heart Primary School are committed to enhancing our students' social skills again this year. The second half of the 2016 school year was a busy and exciting time in regards to our work in this area. As a result of some action research carried out with staff by one of our Assistant Principals, Carolyn Perlini, a Social Skills Committee has been formed. This committee worked tirelessly last year to suggest ways to improve the social skills of our students, enhance the current whole-school social skills program and overall raise the profile of the social skills program this year. We look forward to sharing our journey with you this year. 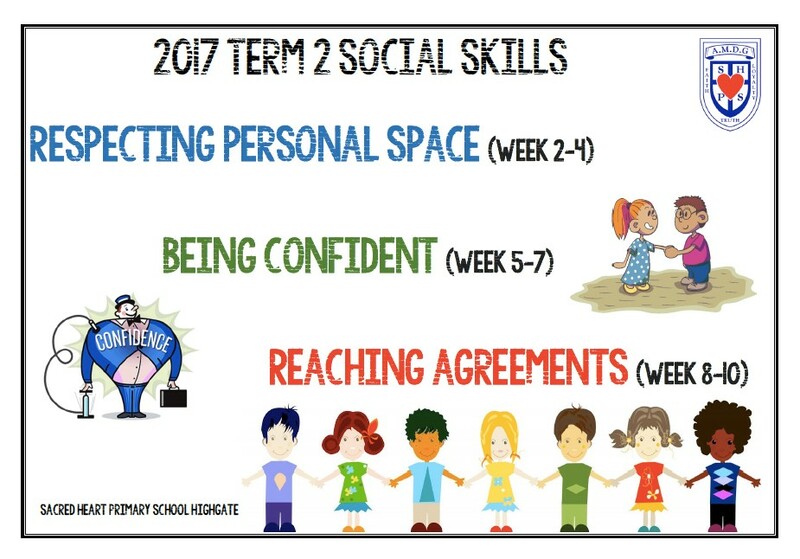 Please find below our school's focus social skills for Term 1. Poster design by Ashleigh Barker (Year 6 Teacher). 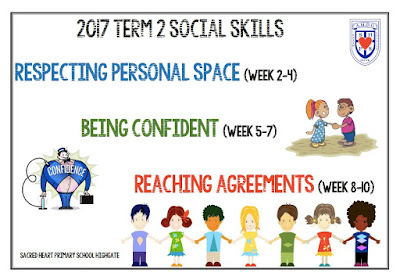 Sacred Heart gets ready to focus on three new social skills in Term 2! We are looking forward to commencing another term of social skills learning here at Sacred Heart. This term will see us focusing on three new whole-school social skills. Being supportive - no ‘put downs’. 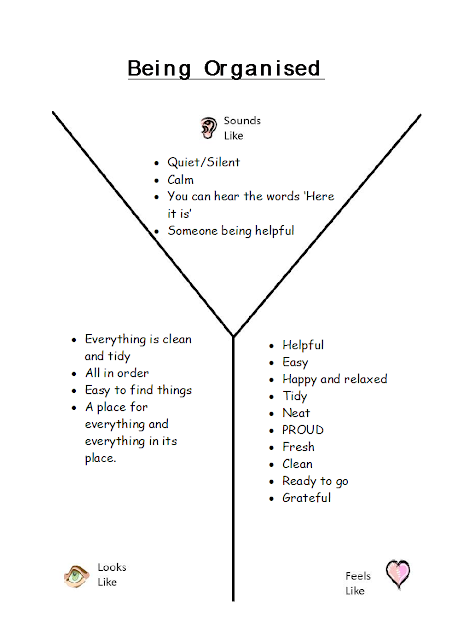 Throughout the term, we look forward to sharing some of the classroom activities that we will undertake to support our students' learning of these three social skills. Watch this space! 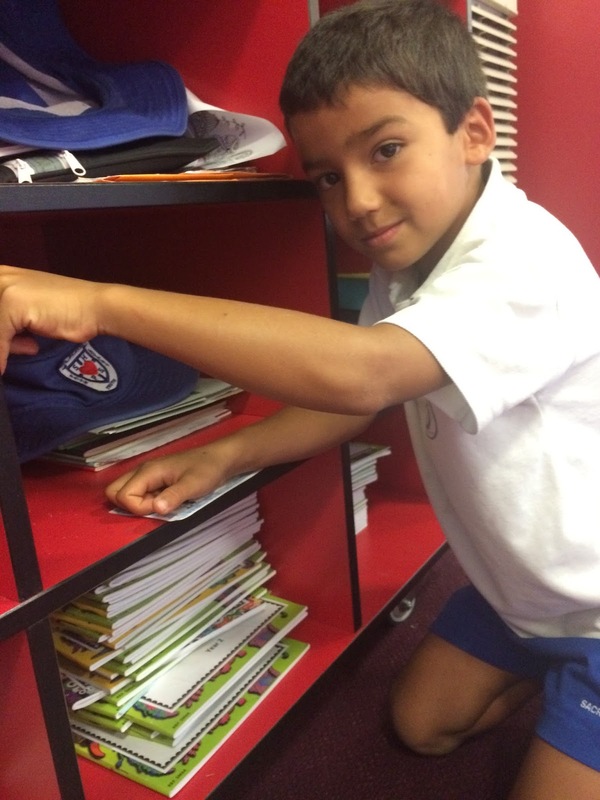 The Year Two class have been busy learning the new whole-school social skill – Being Organised. We have ensured that we have our equipment ready at the beginning of each day and for each lesson and have been responsible for keeping our learning space free of clutter and very tidy. 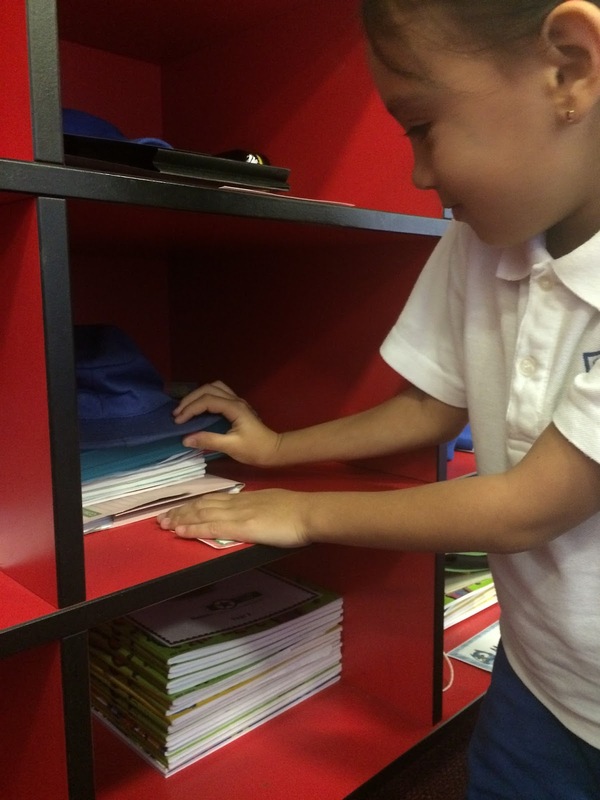 We are getting much better at keeping our lockers tidy and mess free as well. We discussed what Being Organised looks like, sounds like and feels like and created a Y Chart together. The Year 5 class have been busy learning about the Showing Respect whole-school social skill. 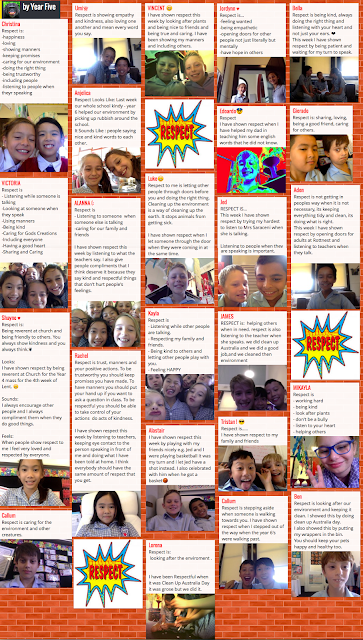 As part of their learning, the Year 5 class used the Padlet App to work collaboratively to create a page about what being respectful looks like, sounds like and means to them. We are sure that you will agree that they did a wonderful job at recording their ideas. Thanks Year 5 students for sharing with the rest of the Sacred Heart community your learning. Well done!